Meet Tom Markson, who joined ZBAG’s team of builders in April. Tom specializes in building rear differentials. Tom recalled the events that brought him to ZBAG. “I was looking for a career change,” he said. 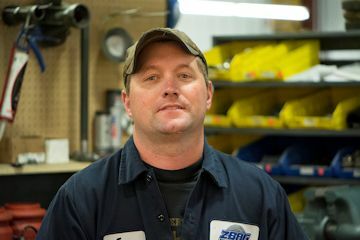 “I was driving truck, and then was a mechanic for the trucking company I had worked for.” He had gotten mechanical training at a vo-tech 20 years previously. At the point when he was searching for something different, another builder told him about an opening at ZBAG, and he found a new position. “I do all the rear differentials,” he noted. Tom’s mechanical training and experience started long before he enrolled in the vo-tech. He has spent time tinkering on equipment since he was young. “When I was a kid, we had a small farm, and I worked on things there,” he said. In the shop here at ZBAG, Tom concentrates on building each rear differential to the highest quality industry standards that our many customers have come to expect.